The Vegetation Package is designed to hold a reference to terrain textures. The amount of textures 0,4,8,12 or 16 is set at package creation. One of the benefits is that you can apply a package to a new terrain and have your textures and vegetation applied to it. Also when you switch between packages you will get the correct textures in the terrain. 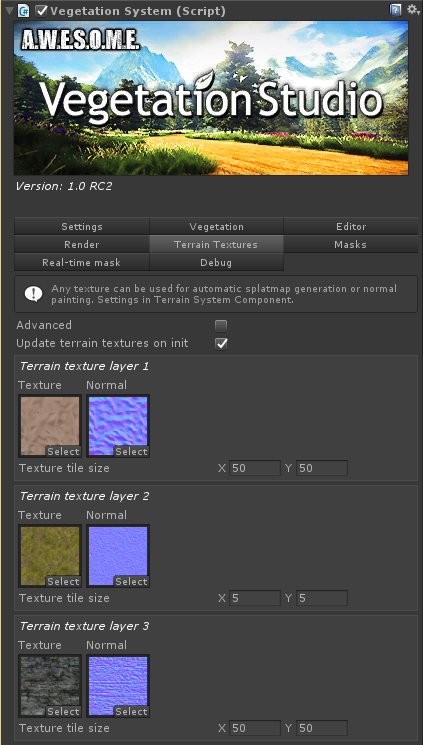 With “Update terrain textures on init” VegetationSystem will check the assigned terrain and update the textures to the textures in the Vegetation Package. This is used to change textures when you switch between packages. Summer, Winter, Desert etc. that do not have the same textures. In normal mode you have Albedo and Normal textures available. These will be assigned to the Unity Terrain. You can also set texture tile size. Advanced mode is for use with plug-ins. It gives you the possibility to assign Ambient Occlusion and heightmap textures also. These external plugins will get the array of changed textures and can be used to apply this to 3rd party terrain shaders.